Anyone who has ever dreamed of going to culinary school, or simply loves food, will enjoy this coming-of-age culinary journey by a top young food blogger. When Jenna Weber graduated from college, there were no jobs to be found. Week after week she searched through the listings and became more and more frustrated. Finally, drastic measures had to be taken. Weber enrolled in culinary school -- not to become a chef, but because she had always wanted to write about food. She also started Eat, Live, Run, a food blog where she could share her experiences as a new culinary student. Today thousands of people love reading her blog regularly; it now focuses on delicious family-friendly recipes, gorgeous food photography, and tasty travel tales. 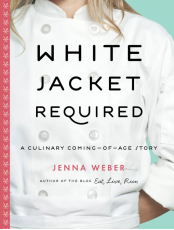 In White Jacket Required, Weber reveals a deeper side of her life and offers an inside look at what went on behind the scenes at culinary school and during the year that followed. Her stories bring you into the school, from the application process to the nitty-gritty details about classes like Meat Fabrication and Bread 101. Follow along as Weber confronts the ups and downs of training, gets her first job, deals with a family tragedy, maintains a long-distance relationship, and enters an exciting new chapter in her life. Scattered throughout you'll find dozens of her delicious recipes, including Golden Granola, Girls' Night Turkey Burgers with Spicy Sweet Potato Fries, Croque Monsieur, Old-Fashioned Chocolate Walnut Torte, and Pumpkin Whoopee Pies. Now that Weber's dreams of writing a book about food have come true, she invites you along for the ride -- no white jacket required!